This resource section offers a comprehensive collection of resources to assist you as you submit your FACTOR application. Whether you’re a first-time applicant, or a seasoned veteran, there’s a lot available to you to guide you through submitting an application. 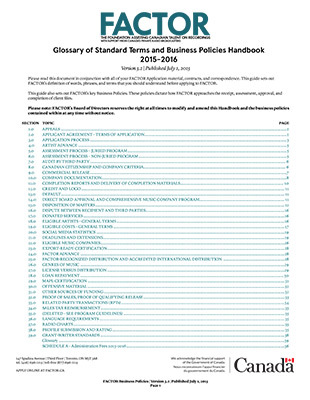 If you haven’t already familiarized yourself with our Business Policies, we strongly encourage you to do so, as this handbook sets out FACTOR’s definition of words, phrases and terms that you should understand before applying. Still feeling lost? Don’t panic. You can always contact us, or browse through our Applicant FAQ section to find answers to your questions. 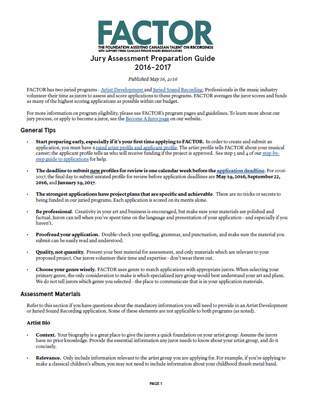 When in doubt, head back to our Application Details page, for clear step-by-step instructions of the FACTOR process. 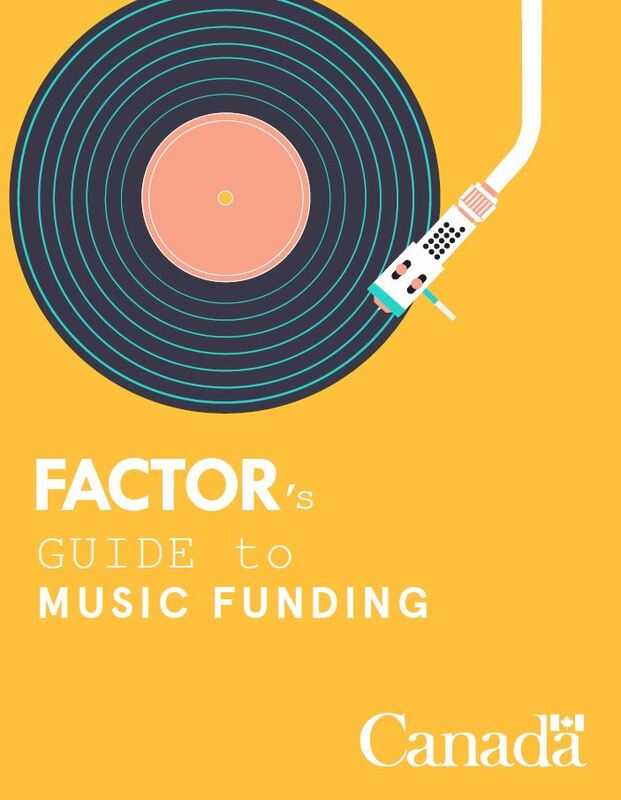 Before you receive FACTOR funding, there are a number of important documents we encourage you to read. 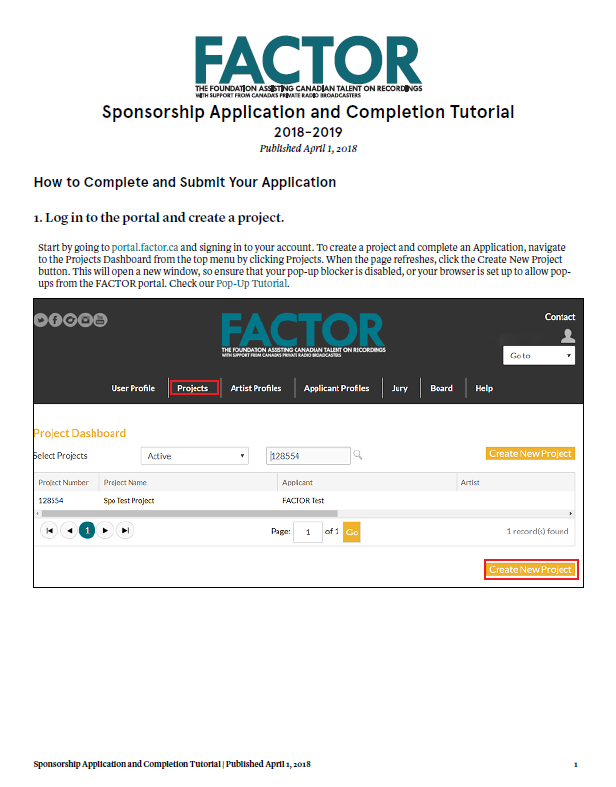 These will make it easier for you to understand FACTOR’s policies, and your obligations as an applicant when you receive an offer of funding. 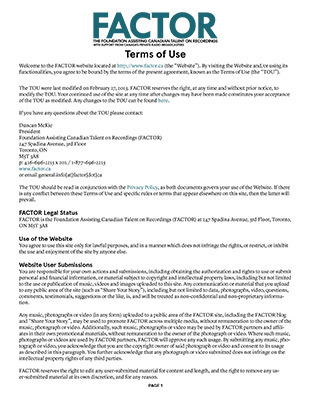 Read FACTOR’s Glossary of Standard Terms & Business Policies. Comprehensive guide to FACTOR policies and terms. 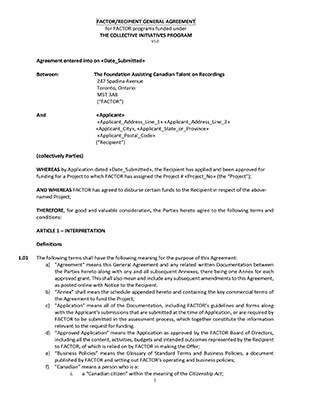 General agreement for projects funded under Collective Initiatives. 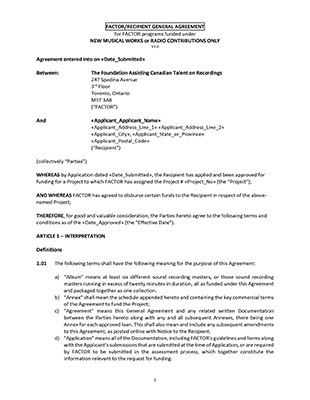 General agreement for all projects (except those funded under Collective Initiatives). 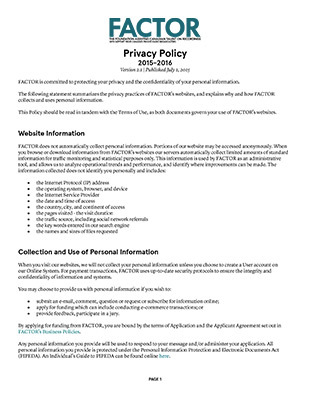 Details conditions of use of FACTOR website. 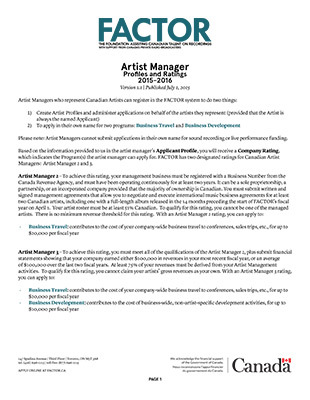 Details minimum requirements for each artist manager rating level. 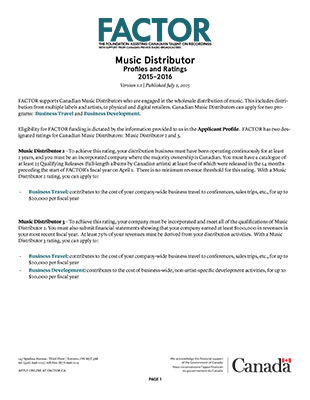 Details minimum requirements for each music distributor rating level. 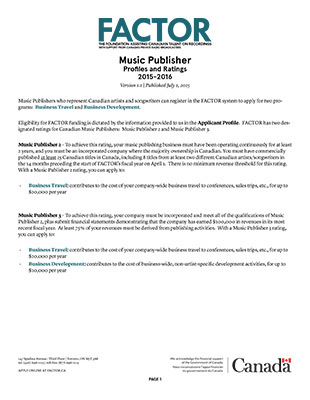 Details minimum requirements for each music publisher rating level. Summarizes policies regarding collection and use of personal information submitted to FACTOR. 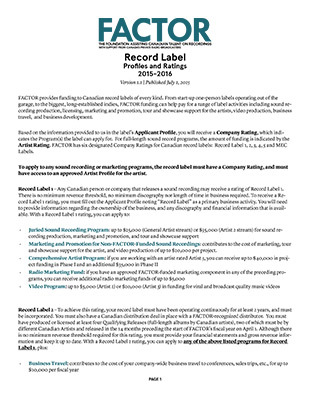 Details minimum requirements for each Record Label rating level. 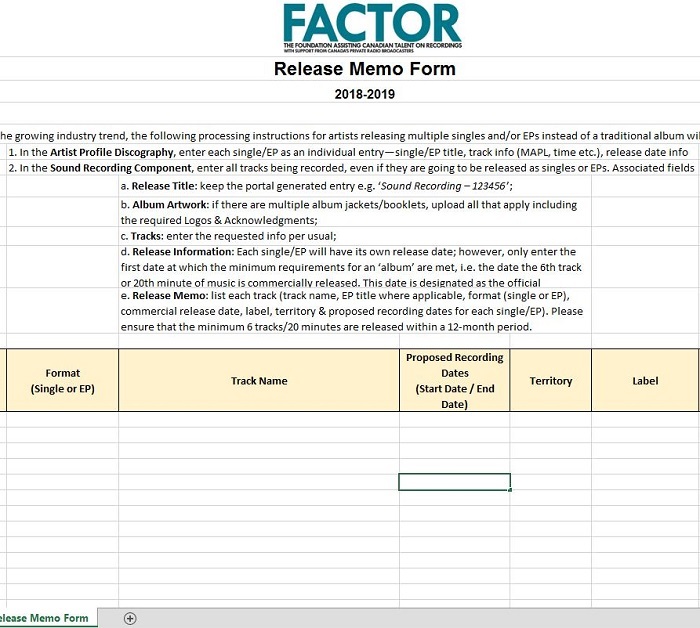 We’ve made it easy to navigate your way through the FACTOR system with these handy guides and tips. Whether you’re putting together an application, or curious about where else you may apply for funding, these can help. Introduces FACTOR, profiles, programs, deadlines, and application requirements. A list of FACTOR’s Primary Genres. 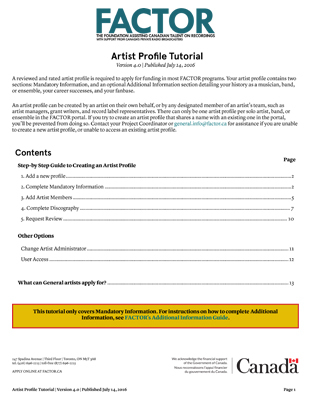 Explains process of creating and completing Mandatory Information for an artist profile in the FACTOR portal. 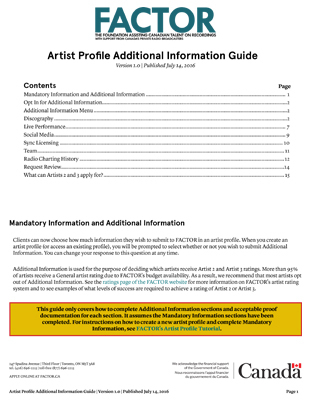 Details how to complete Additional Information sections of the artist profile, and acceptable supporting proof documentation for each section. 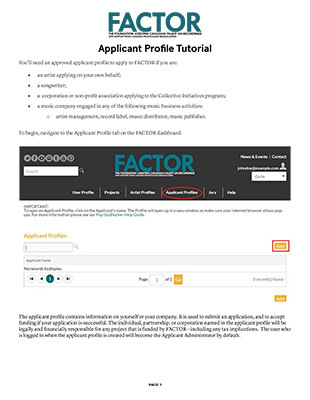 Explains process of creating and completing an applicant profile in the FACTOR Portal. 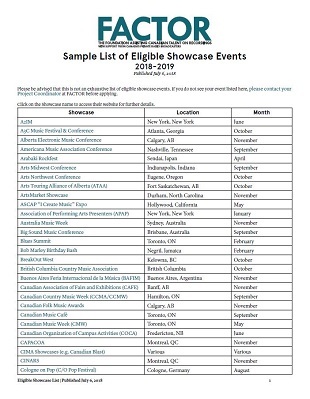 List of provincial and national music and arts funding organizations. 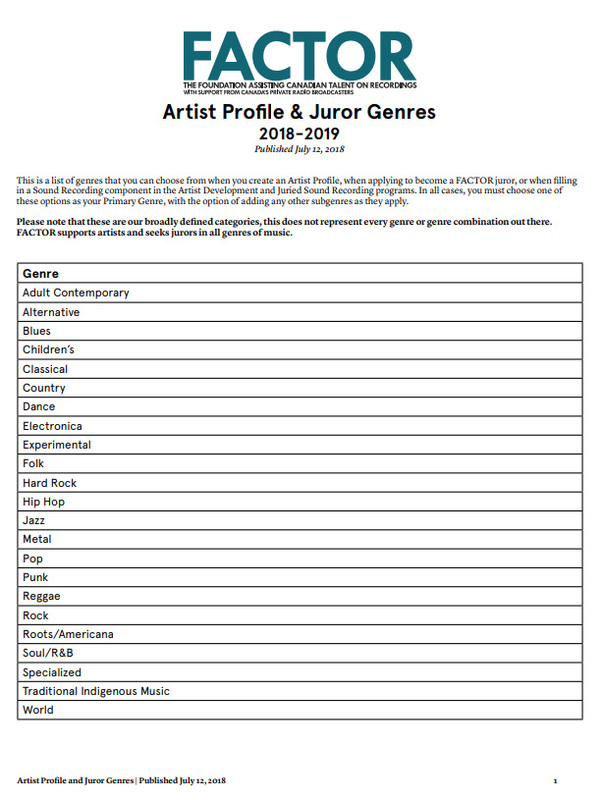 Explains required materials and scoring breakdown for juried programs (Artist Development and Juried Sound Recording). 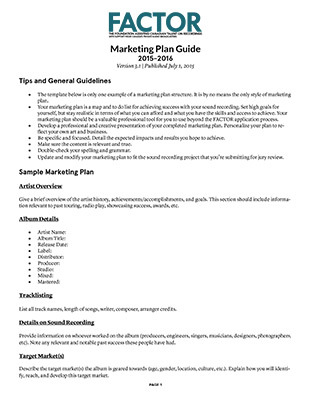 Sample elements and tips to create a successful marketing plan for Juried Sound Recording applications. 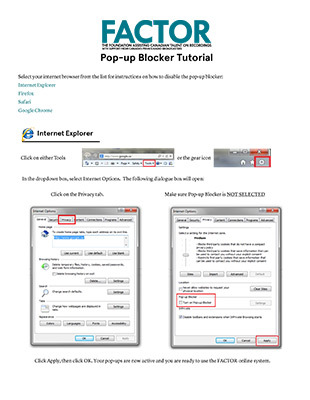 Explains how to disable your browser’s pop-up blocker to access FACTOR portal. 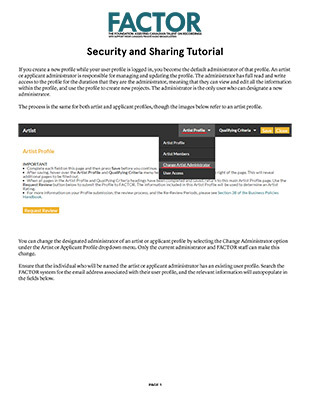 Explains how to share profiles and projects with other users in the FACTOR portal. 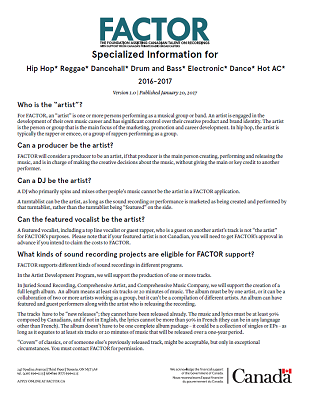 Answers common questions about artists applying within the Hip Hop, Reggae, Dancehall, Drum & Bass, Electronic, Dance, and Hot AC genres. 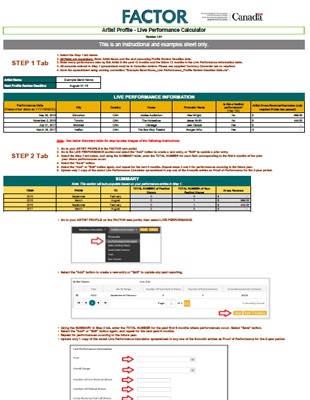 Explains how to complete and submit Sponsorship Application and Completion. 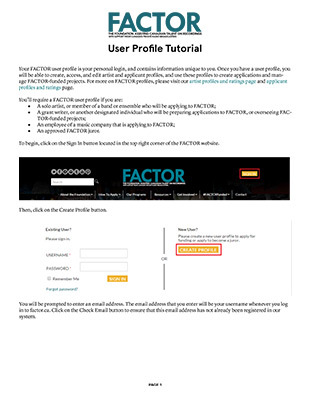 Explains process of creating and completing a user profile in the FACTOR Portal. 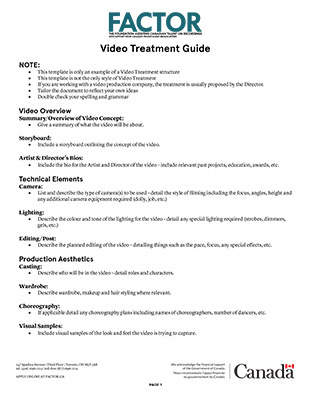 Template for a video treatment structure (for Video program & component applications). 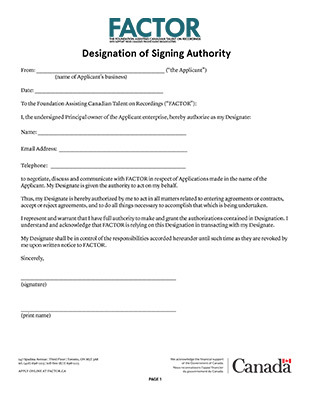 Depending on your project, we may require one or more of these forms from you in order to move forward with your application. Speak to your project coordinator about which, if any, of these forms you might need. See our Applicant FAQs or contact us. 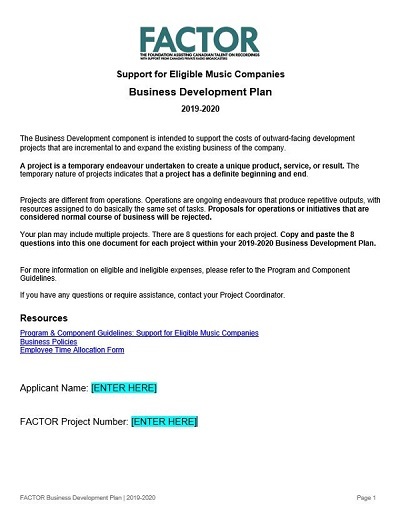 Required template for project applications to the Business Development Program. Grants authority for a party to act on your behalf regarding FACTOR-funded projects. 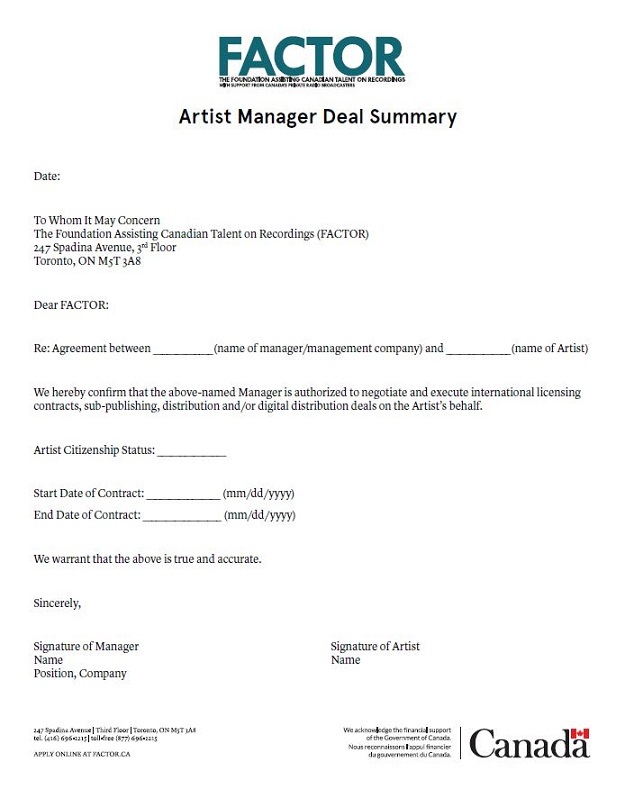 Used to calculate revenue from album sales (digital and retail) for the purposes of determining your artist rating. A list of pre-approved showcases for Showcase component applications. 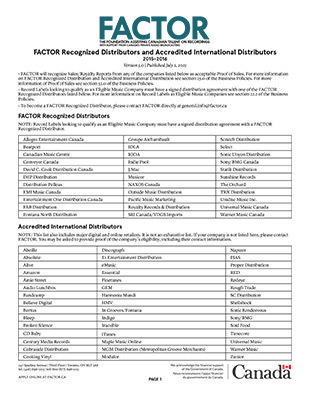 List of domestic and international music distribution companies recognized by FACTOR. 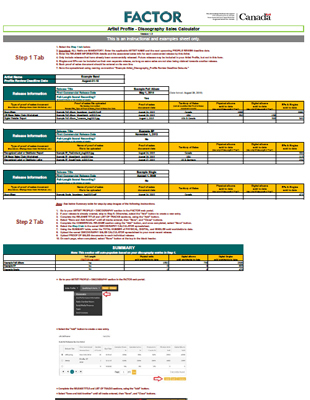 Used to calculate revenue from live performance dates for the purposes of determining your artist rating. 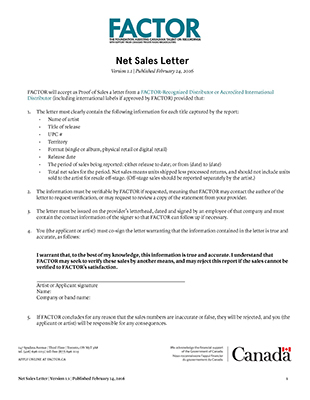 Requirements for proof of sales in the form of a letter from a FACTOR-Recognized Distributor or Accredited International Distributor. 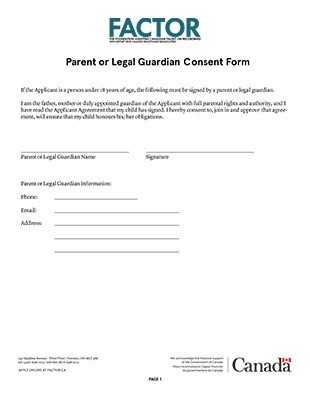 Required when applicant is under 18 years of age, confirming parent or guardian’s consent. 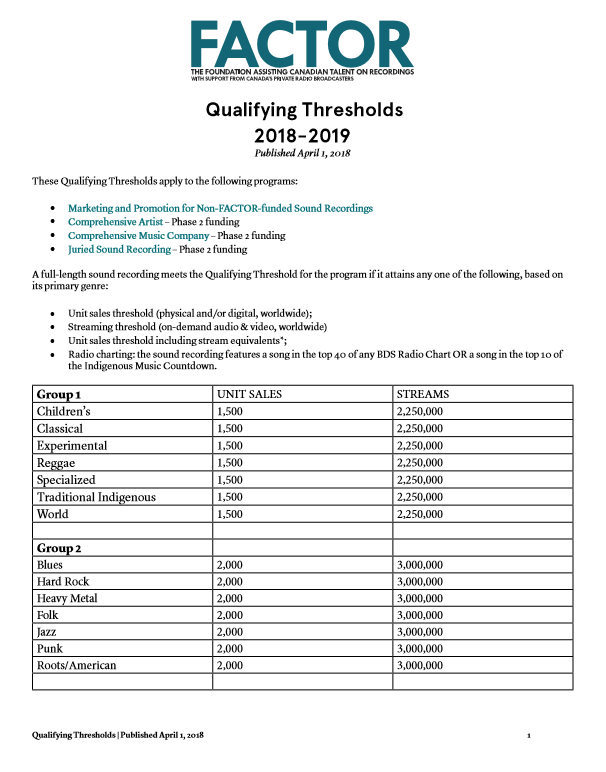 Use this form to identify the six singles that are being compiled to meet the full album Qualifying Release requirement. 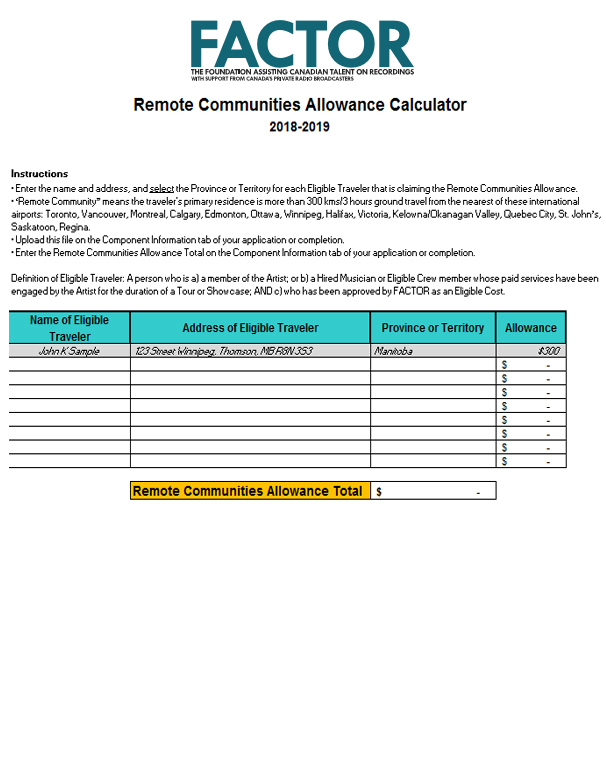 Instructions for Remote Communities Calculator. 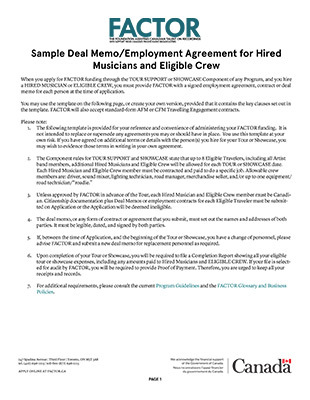 Template for contracting hired musicians or eligible crew in Tour or Showcase component applications. 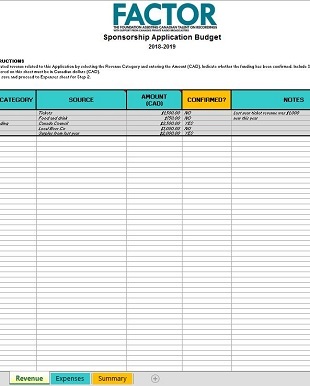 Budget template that must be used in Sponsorship applications. 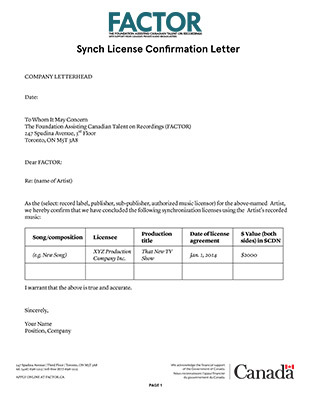 Template for supporting documentation in sync licenses section of artist profile.